We bought an enormous upholstered ottoman for our very large family room in our last house, and while it’s a bit big for our current house, it’s super comfy for putting your feet up while watching a football game in a front of a fire, so we decided the family room was the best place for it. but with three kids I worried about this option – they are not exactly gentle, my cherubs. So the mirror went onto a wall, where the darlings are less likely to shatter it, and I was back to my ottoman issue. I simply could NOT find a tray that was big enough and within my budget. So what’s a girl to do but build her own tray? When I recently “inherited” some nautical charts from my parents-in-law, I realized one of them would be perfect in size and color for my tray project! 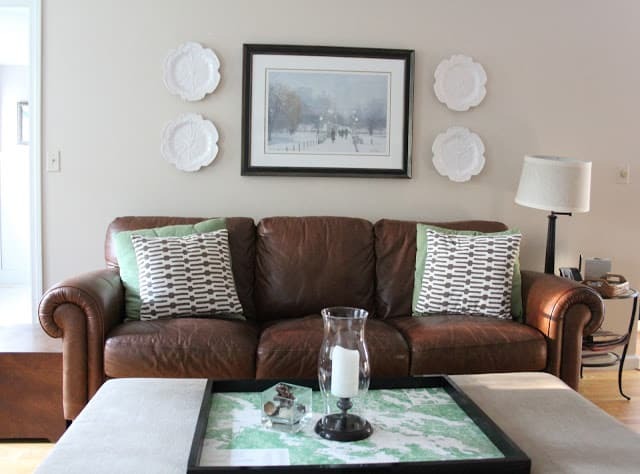 The end result is super functional as well as bringing a little personality to our family room. 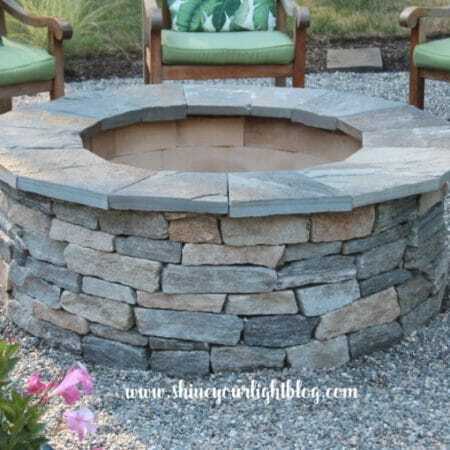 This is a really easy project for a newbie carpenter, just a few cuts and joins! 1 | I bought a piece of 1/4″ oak plywood – oak because it seemed to be the most non-warped of the plywoods, but birch is another great option because it’s smooth. I had the plywood sheet cut down to a smidgen bigger than the map in the store. 2 | Then I sanded the edges and Mod Podged the map onto the the plywood. 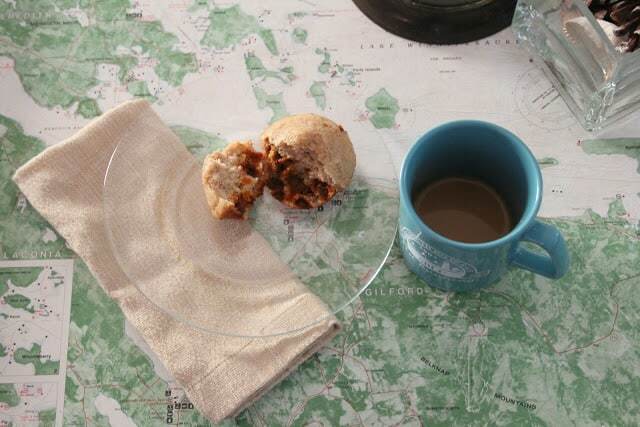 I also coated the top of the map with Mod Podge so the surface of the tray would be protected from spills. 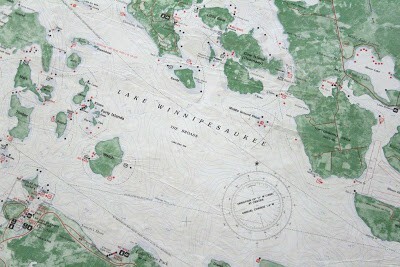 4 | When the trim was dry, I attached the trim to the plywood, covering the edges of the map. I used wood glue, then put crown staples every 2″ or so with my nail gun. 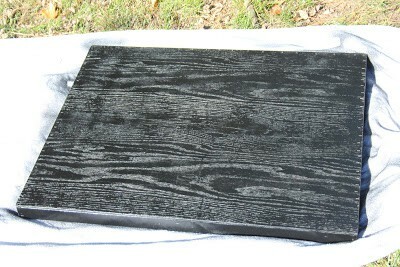 5 | Yesterday when the sun was actually shining, I took the tray outside and gave the bottom of the tray and the sides a couple coats of glossy black spray paint to finish it off. 6 | Lastly, I added handles – aka cabinet door pulls. I inset the screws into the trim and then puttied over them and touched up with paint. 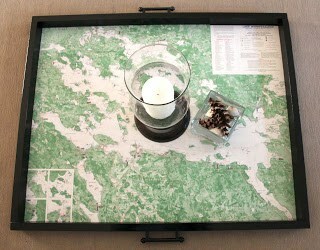 Lake Winnipesaukee is one of our favorite places, and I think the green and white map is perfect with the colors in the family room. 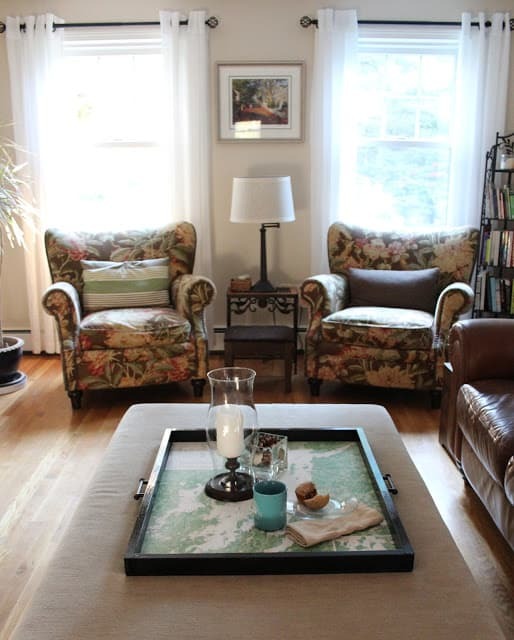 It’s not huge, but big enough for some refreshments, plus it makes the ottoman look less like a twin bed in the middle of our family room, and more like an actual coffee table. 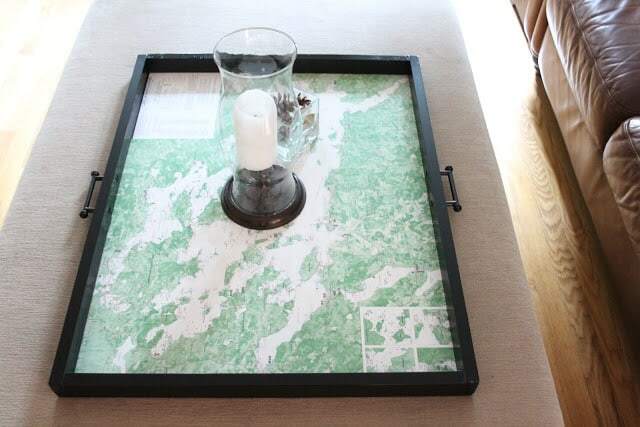 and a glass of red wine on my new map tray. Come over and join me, would you? That’s the story of my little old ottoman map tray. If you can’t find a tray you like, just build your own! 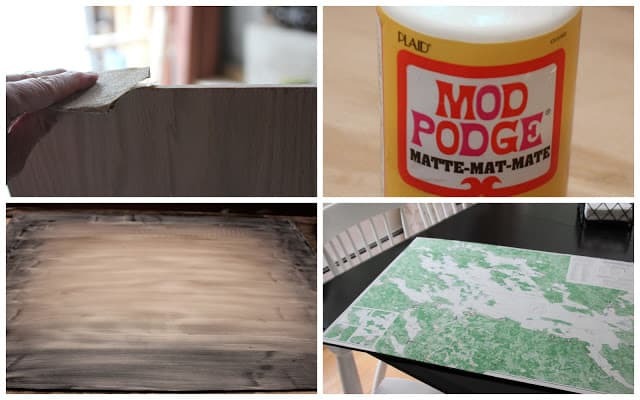 If you are looking for more map projects, check out this post at Simple Details! Wishing you a happy weekend ahead my dears! 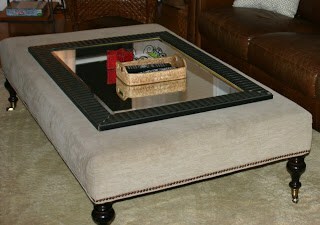 I knew you'd have a cool diy, and I love that huge ottoman! You have to pin it on the 'obsessed with maps' Pinterest board, there were a lot of projects and not one like this, you creative girl! Your chairs are perfect in there, too! So quick and easy! I love it! it looks fabulous and i love the punch of color it adds! Lisa! It looks so expensive and not DIY at ALL. TOTALLY fabulous!! i would love to come over and join you. Red wine is my favorite. You did an awesome job, and solved this so creatively. Enjoy the fire. 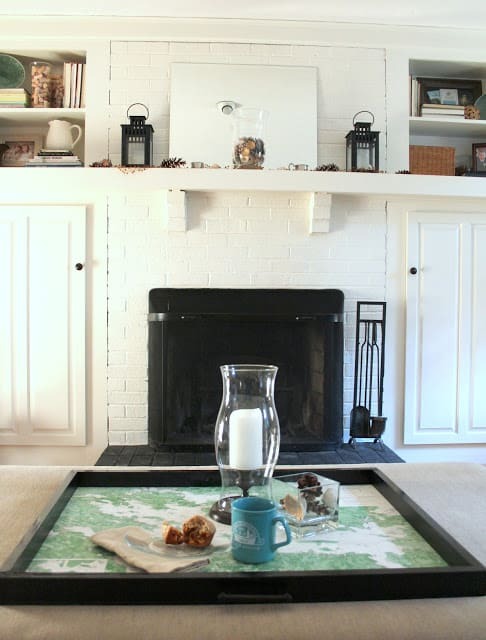 Love the nautical map and the color/pattern it brings into the room. 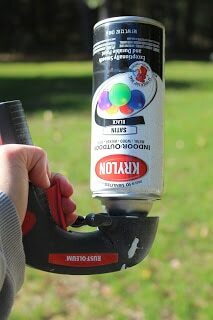 What a perfect DIY and great use of a gift. I love it! I really love the green map. So unique! This is one of the things I appreciate about you…can't find it? Oh well, I'll just make it. You're awesome like that! 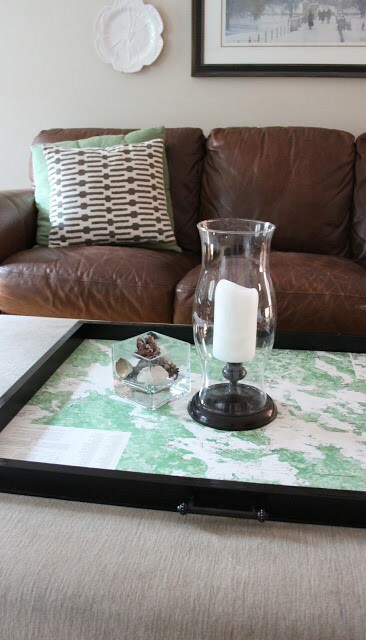 I love what you did with the ottoman tray, it is perfect! Great job. A perfect place for a map… hope your little man doesn't mind losing his nap spot! Single. Best. Spray. Paint. Tip. Ever. Oh, and love the tray too! You are brilliant! I think if you could have or would have spent a chunk of change on a tray, it wouldn't have been better than this one! How satisfying to know you made it yourself, and it's such a personal, functional and interesting accessory! So clever! I love a good map project.